There are likely very few consumers who didn’t consider — if only for a second — being the winner of the Powerball jackpot when it goes beyond $350 million. While not every of-age person living in the nation have a tendency to gamble with the hopes of winning big, there are many that are still relying on the crutch gambling seems to give them in that ‘one day’ they will hit it big, get rich quick, and all of there financial woes will disappear. What is really happening for those betting on the big win is more of a financial problem then many will realize. Using the lottery and hedging your bets in order to get out of debt is an illogical strategy and demonstrates poor financial management. Those who do not take the right steps to rectifying debt problems are on a sure path for continued money struggles. Those who strive to win the millions rather than work for it will likely continue to struggle the majority of their lives until they come to terms with reality. Most state and national lotteries print the odds of winning right on the ticket. Typically, the chance of winning the big prize in the huge lotteries is about one in a 150 million. The odds of course depend on how many people are actually playing but for the sake of this argument, lets assume we are dealing with a 150 million to 1 ratio. The only way, outside of luck, to guarantee your big win is to purchase 150 million of those lottery tickets — yes, I said 150 million tickets. If you tend to buy your lottery tickets twenty at a time, you’d have to continue playing your numbers for the next 145,000 years. Those that sponsor lotteries count on a person’s tendency to want more and dream big. Those who are so convinced they have a shot at winning will think nothing of buying more tickets or putting more dollar bills in the slot machines. They know we all dream of huge financial windfalls. The casino owners, lottery commissions, and other organizations are fully aware of it and make a ton of money each year as a result. If you continue to short yourself much needed cash week after week in hopes of holding the winning ticket, the only person you are likely making rich is someone else. Casinos and lottery organizations are not inherently built to lose. While some loss does occur, you can bet your bottom dollar they will never struggle like a consumer does trying to make ends meet. You may be ready to argue the fact that some lucky people have hit it big several times over. While that is true, it is mostly again due to luck. They are not called ‘games of chance’ for no reason. The real winner in the lotto game is the one who can effectively say no and put their couple of bucks to much better use each and every week. If you purchase 1 one-dollar lottery ticket each day of the week, it will cost you $365 a year. If you purchase 5 one-dollar lottery tickets each day of the week, it will cost you $1820 a year. If you purchase 10 one-dollar lottery tickets each day of the week, it will cost you $3640 a year. You can do the actual math of your own spending tendencies when it comes to the lottery but as you can see, just one ticket a day can be turned into a car payment, five tickets can mean a mortgage note, or ten tickets can become a credit card balance pay-off. Gambling in other forms can be more dangerous, especially if you are carrying your credit cards and ATM cards in your wallet. When you run out of cash but ‘feel’ you are close to winning, you can rack up huge balances and fees associated with cash advances. Plus, if you are not giving yourself a reasonable budget before heading into the casino, you are sure to overspend. Another drawback associated with lotteries or other types of gambling. Many who do win decent sums of money that have never learned to handle any amount of cash will likely either put all the money back in the slot machines rather than go home. Those who win gigantic sums from the lottery commissions have had headlining-making lives of disaster. Rarely does a lottery winner boast first of being debt-free. They quit their job and blow through the winnings so fast, their head is still spinning when the bill collectors start calling again. Save yourself the hassle and dedicate all of your lottery spending toward a savings account. Even if only for one year, you can quickly see the advantages of saving over lottery playing. 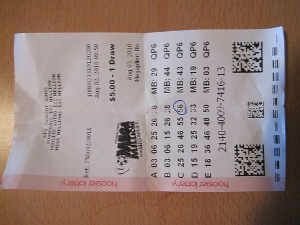 If you can’t resist the temptation, at least do yourself a favor and first sit down with your budget and bills to find out exactly how much cash you have to spend on lotteries and table games. Take no more cash with you than that and be sure to leave when you are out of money. Does Investment Portfolio Diversification Still Work?